292 HISTORY OF CAMBRIA COUNTY. Leonard Boyer; cap. at Salem, Va., P. V. ; date unknown. Oct. 5, 1864; disch. by Gen. Order Charley C. Henderson; trans. to Co.
Sept. 29, 1865. E, 147th P. V.; date unknown. John R. Betts; must. out with bat'y. county, Pa., Feb. 18, 1865. Christian Betts; must. out with bat'y. James Johnson; must out with bat'y. Edward Bird; must. out with bat'y. George Jenkins; must. out with bat'y. Samuel C. Bailey; disch. by Gen. Or- David Jenkins; must. out with bat'y. der June 9, 1865. Fletcher Johnson; must. out with bat'y. Joseph Brindle; died at Fort Reno, D. John C. Jones; must. out with bat'y. C., Sept 28, 1864; buried in Nat Thomas Jones; must. out with bat'y. Cem., Arlington, Va. David R. Jones; must. out with bat'y. Rufus Crissey; disch. by Gen. Order, Chas. Kennedy; must. out with bat'y. June 13, 1865. Samuel M. Kern; must. out with bat'y. Franklin Clark; must. out with bat'y. Henry Koch; must. out with bat'y. Benjamin Cover; must. out with bat'y. Edmund Korns; must. out with bat'y. John Cooper; must. out with bat'y. William Koontz; must. out with bat'y. Sylvester Crum; must out with bat'y. Morris Kell; must. out with bat'y. William H. Clossin; died at Alexan- Adam Kemery; must. out with bat'y. dria, Va., Jan. 7, 1865. John Kuhns; must. out with bat'y. Christian Deitz; must out with bat'y. Michael Kelly; must. out with bat'y. Jac. Dull; disch. by G. O. June 13, '65. Joseph P. Kyle; must. out with bat'y. Christian Darres; missing in action at George Kunkle; must. out with bat'y. Salem, Va., Oct. 5, 1864. Theo. Kimmel; must. out with bat'y. David L. Davis; must. out with bat'y. Rob. T. Kincaid; must. out with bat'y. Reese D. Davis; must. out with bat'y. Michael Lotz; must out with bat'y. George Eigner; must. out with bat'y. John Lock; must. out with bat'y. Sylv. Elleman; must. out with bat'y. John Lohr; must. out with bat'y. Conrad Eichensayer; disch. by G. O. June 13, 1865. George Foltz; must. out with bat'y. Aaron Lohr; must. out with bat'y. John L. Fenn; must. out with bat'y. David Luther; must. out with bat'y. Josiah Frank; must. out with bat'y. Benj. Luther; must. out with battery. Lewis Fisher; must. out with bat'y. Finley P. Luther; must. out with bat'y. George Fisher; must. out with bat'y. Sam C. Luther; must. out with bat'y. Hiram B. Folsom; disch on surg. Gen. Order June 13, 1865.
cert. March 24, 1865. John A. Luther; must. out with bat'y. John Griffith; must. out with bat'y. George Ludy; must. out with bat'y. William Gable; must. out with bat'y. Harris Lenhart; must. out with bat'y. Nicholas George; must. out with bat'y. 147th P. V.; date unknown. Ignatius Gfroer; must. out with bat'y. 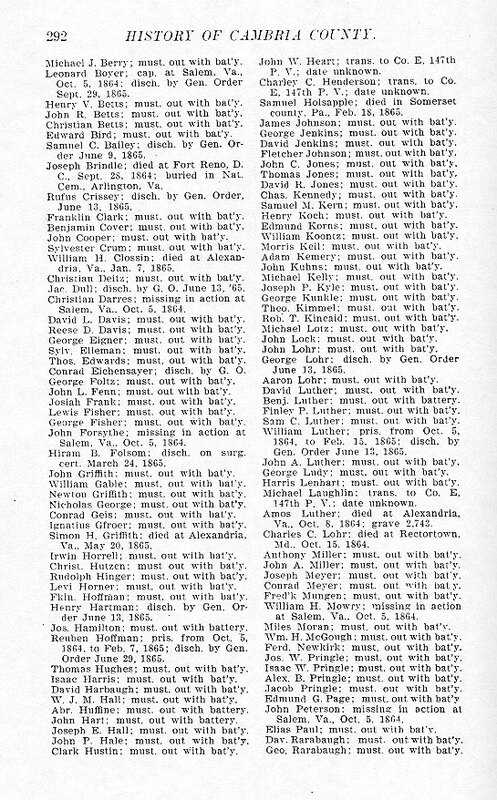 Va., Oct. 8, 1864; grave 2,743. Va., May 20, 1865. Md., Oct. 15, 1864. Irwin Horrell; must. out with bat'y. Anthony Miller; must. out with bat'y. Christ Hutzen; must out with bat'y. John A. Miller; must. out with bat'y. Rudolph Hinger; must. out with bat'y. Joseph Meyer; must. out with bat'y. Levi Horner; must. out with bat'y. Conrad Meyer; must. out with bat'y. Fkin. Hoffman; must. out with bat'y. Fred'k Mungen; must. out with bat'y. der June 13, 1865. Miles Moran; must. out with bat'y. Jos. Hamilton; must. out with battery. Miles Moran; must. out with bat'y. Reuben Hoffman; pris. from Oct. 5, Wm. H. McGough; must. out with bat'y. 1864, to Feb. 7, 1865; disch. by Gen Ferd. Newkirk; must. out with bat'y. Order June 29, 1865. Jos. W. Pringle; must. out with bat'y. Thomas Hughes; must, out with bat'y. Isaac W. Pringle; must. out with bat'y. Isaac Harris; must. out with bat'y. Alex B. Pringle; must. out with bat'y. David Harbaugh; must out with bat'y. Jacob Pringle; must. out with bat'y. W. J. M. Hall; must. out with bat'y. Edmund G. Page; must. out with bat'y. John Hart; must. out with battery. Salem, Va., Oct. 5, 1864. Joseph E. Hall; must. out with bat'y. Elias Paul; must. out with bat'y. John P. Hale; must. out with bat'y. Dav. Rarabaugh; must. out with bat'y. Clark Hustin; must. out with bat'y. Geo. Rarabaugh; must. out with bat'y.